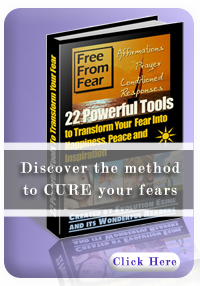 How our fears create phobias and how to overcome them. Practical techniques to create a stress free life. Phobia - what is it? Phobia is present when a person is frightened beyond more than what the situation or object causing the fear would usually be considered reasonable to cause. Additionally, the fright may be groundless, with the fear only being based on internal processes and not external events. In these cases, the mind exaggerates the situation and portrays it in such a way that generates fear within, resulting in the development of the phobia. The resulting phobia also generates avoidance behaviour towards the phobic stimuli, possibly resulting in the disruption – or worse – of one’s everyday routine. WHY ARE WE PLAGUED BY PHOBIAS ? There are a few reasons why we are plagued by certain phobias. You may be experiencing some inner conflicts that you find difficult to find a solution to. Hence to help you release some of your pent up feelings, you externalize them onto an outside object. An example would be a girl afraid of heights. Even looking down from the fourth floor makes her irrationally afraid. This might be because she is actually secretly trying to repress her persistent thoughts of committing suicide, or even throwing her beloved dog out. Research has shown that phobias may be a result from a traumatic event that may have occurred to the phobic. An example here would be a woman who got bitten by a stray bulldog when she was a young girl. She may now avoid any kind of bulldogs after this incident, even though the bulldogs that she may encounter later may not be threatening in the least. Like any illnesses that we may have, phobias can be treated. However, it is often a long and tedious journey to recovery. Below are a few ways to help a phobic overcome his or her fear. Imitation is the key factor to the success of a person's development in this treatment. It is obvious that people learn best when they can observe and try to imitate a model. This phenomenon can often be seen in infants, for whom learning by imitation is a vital part of their acclimatisation to this world. Take the previous example of the lady who was bitten by a bulldog when she was a child. If over time she is able to observe a bulldog owner groom, play and cuddle up with their pet, she may later be ready to model the behaviour of the owner. This may be achieved through a cautious approach towards the dog and eventually being able to pat and play with it. Through these activities, she would gradually be able to overcome her fear of bulldogs. This treatment encompasses three major steps. Identifying the causes that provoke the phobia, and arrange them in hierarchical order from weakest to strongest. In the relaxed state of mind, visualize the weakest cause from the list. If it still causes you to shudder from fear, return back to step b) again, until you are able to visualize it without being fearful. Then work through the list created in step a) till you are able to think of the strongest cause without any fear. This way of treatment would be ideally suited for specific phobic reactions.. It is successful when applied to a wide range of problems that we encounter. A kind of therapy that hones in on helping people see meaning in their lives. Research has shown that people who suffer from phobias are not specifically concerned about the object or situation that they fear; instead they are much more afraid of being afraid about it. This is termed "flight from fear". This flight from fear may be even more damaging than the fear itself, as it actually acts as the trigger to the person's fear - a phobic reaction. This treatment encourages the phobic to do, wish for and hope for the very thing he/she fears to happen. So instead of thinking damaging and fearful thoughts, the phobic are should face their fears head on and overcome them. A phobic should expose him/herself to the situation or object that he/she most fears. This is done as research has shown that when a phobic puts him/herself into the situation or faces the object he/she fears head on, and stays put in the situation (or with the object) without running away, his/her fear of it would peak initially and then slowly disintegrate. It is essential that the phobic stay put till his/her fear of the object or situation disintegrates. NOT SURE IF YOU ARE A PHOBIC? Zimbardo Philip G., Psychology and Life 10th Edition, 1979, Scott, Foresman and Company Glenview, Illinois. Fox Bronwyn, Power over Panic - Freedom from panic/anxiety related disorders, 1997, Longman, Australia. Bullock Alan & Stallybrass Oliver, The Fontana Dictionary of Modern Thought, 1977, Fontana/Collins, Britain. There are two steps in solving a problem. Believing you can solve the problem and solving the problem. Once you have established belief you are more than half way there. You may not always find happiness from your actions, but you will never find happiness from inaction. The advice and information offered on phobias.com.au is intended to offer an insight into a person’s psychological well being and do not in any way constitute medical, legal, financial or any form of professional advice whatsoever. Phobias.com.au Copyright 2017©. All Rights Reserved.